Rev. Dr. Martin Luther King Jr.. Happy Birthday Rev! 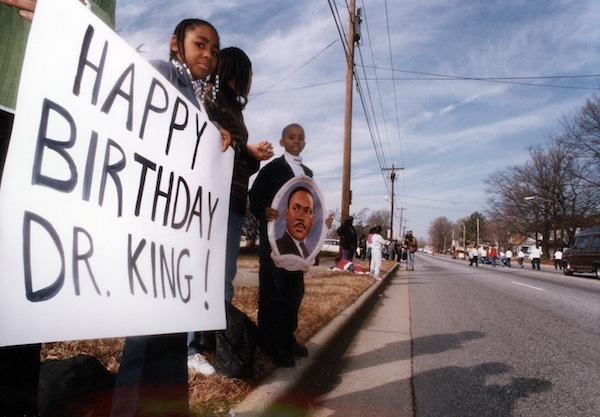 Michael Luther King was born on this day in 1929, in Atlanta, Georgia. He received his father’s name “Martin” at the age of six. Dr. King’s LAST SPEECH was his famous “I’ve Been the Mountaintop”. What is not well known, is his LAST SERMON – “The Drum Major Instinct” delivered to his congregation from the pulpit of Ebenezer Baptist Church on February 4, 1968. Of all of his speeches & sermons, “The Drum Major Instinct” is by far my favorite. This sermon defined for me TRUE LEADERSHIP as well as to seek greatness through service and love. So many think leadership is based on your obtained position…WRONG. TRUE LEADERSHIP, as Doc, teaches from Mark 10:35, is based on SERVICE. He tells, Jesus said to his disciples, he who is GREATEST among you shall be a SERVANT. He who is SERVANT of all, shall be CHIEFEST of All. This has been my guiding principle. He goes on to say that as babies we cry for attention because of the Instinct. As adults, he said we love the attention from being praised and that only time we don’t like praise is when that PRAISE is going too much towards someone else (Doc, did you just call out HATERS?). He says that every one of us likes to be praised because of this Real Drum Major Instinct. In effect Dr. King, is saying in some form or fashion we want to be FIRST because of this Instinct that is naturally inside of us. We want to be The Drum Major and lead the Parade. Right now I can hear some of you saying, “that’s not me, I don’t want to be out front”. This may be true BUT, YOU LIKE PRAISE…you lying if you say otherwise. In the end, The Good Dr. says its okay to want to be FIRST, but be FIRST in LOVE. Be FIRST in GENEROSITY. Be FIRST in SERVICE to humanity (feed the hungry, clothe the naked, visit those in prison, etc). Be FIRST in UNDERSTANDING. Be FIRST in putting YOU LAST. Teach me Doc, teach me! We are all better having had such a Drum Major. But what of his Marching Band? What manner of people were they? His Marching Band was VISIONARY. His Marching Band was UNSELFISH. His Marching Band was COURAGEOUS. His Marching Band was DETERMINED. My Mama was in his Marching Band, that’s how I know! It’s been a longgg longg time coming.. but a change is gonna come. Let us go and make change!